Carl Pope became Chairman of the Sierra Club in 2010, after serving for more than 17 years as Executive Director. He has been with the Sierra Club for more than 30 years. Under Pope, the Sierra Club helped protect nearly 10 million acres of wilderness, including the California Desert, Utah's Grand Staircase-Escalante National Monument, and California's Giant Sequoia National Monument. The Sierra Club also collected more than 1 million comments--the most public comments on a single regulatory issue in history--in support of protecting the remaining roadless areas in America's National Forests. More recently during Pope's tenure, the Sierra Club led the way in helping to block more than 125 proposed new coal fired power plants and achieving a 40-percent improvement in the pollution and fuel efficiency of America's passenger vehicles. The Club also brought the initial lawsuit that led the Supreme Court to rule in 2006 that greenhouse gasses, including carbon dioxide, are subject to regulation under the Clean Air Act. Here, Pope discusses the limitations of technological approaches to fighting climate change, how to think about environmentalism in simple ethical terms, and Google Earth. When I am alert, I say something like "try to keep wicked people awake at night." When I'm on autopilot, "I'm trying to understand how we fix the world, starting with the energy sector." What new idea or innovation is having the most significant impact on how people think about sustainability? The understanding of the difference between competitive capitalism, predatory capitalism, and incumbent capitalism--that they work very differently, and that moving towards genuinely competitive capitalism opens huge new, but not automatic, opportunities for a better, cleaner, greener future. Closely linked is the fact that testing new ideas against their potential to be disruptive helps us identify the most promising pathways. What's something that people just don't understand about environmentalism? At its heart environmentalism is the struggle to apply simple ethical rules--thou shalt not kill, thou shalt not steal, clean up the milk you spilled--in a world in which science informs us that flipping my light switch may help destroy a community hundreds of miles away in West Virginia, or that the way I choose to get to work in the morning may impact the frequency of deaths from flooding in Bangladesh. Modern technology, a global economy, and scientific knowledge make living ethically almost unbearably challenging. What emerging sustainability trend do you think will shake up your field? A dawning recognition that in a world in which climate is changing and contingent, ecological solutions, not engineering fixes, are the only way forward. If we want to deal with unpredictably rising sea levels, we need more wetlands and flood plains, not levees and seawalls. People trying to find one magic bullet to remake the world--say, cap and trade, or new technology. What's an idea that you became fascinated by but that ended up taking you off track? Figuring out the best way to put a price on carbon, before we had created a sufficiently robust and powerful clean energy sector to have a shot at imposing one if we had figured it out. John Muir for giving it spiritual resilience. David Brower for opening it up to everyone. Ken Saro Wiwa for searing in our memories the reality that in many places, people who work for the future die for the future. International development aid. But at the time it meant working for Richard Nixon. A bridge too far. Google Earth on my Droid. 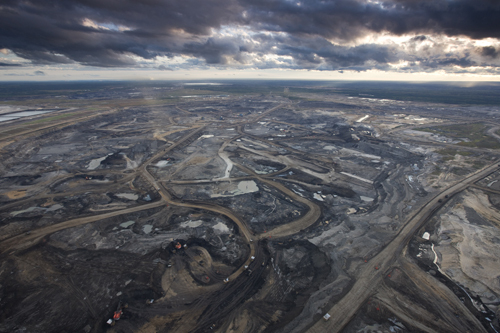 Being able to see the Canadian tar sands on my phone reminds me how much is at stake. "When I'm 64." Because I'd love to get back there.